There will always be room for dessert. Such a classic saying that applies to most of us. Well, who wouldn’t be craving for those sweets, dripping chocolate, buttercream, that’s presented in such an eye-catching way? Dessert can both stop you from craving for another foods after finishing a meal and pleasing your taste buds with sweetness that will last in your mouth, at least before you eat another meal. If you’re being asked, what kind of desserts have you ever tried, then probably you would say cake. But, you know what? No matter how often you eat cakes, you might have never taste the cake that’s traditionally made in another country, right? Those traditional cakes and desserts that people rarely know about, is usually the hidden gem that you absolutely should try. Well, what are the most favorite dessert in Russian cuisine that you should know and even better if you try? You won’t regret knowing this, who knows one day you’ll find yourself sitting in a café in Russia and got to choose dessert that you want to try after favorite foods in Russia during summer. If you found such name is a bit unfamiliar, don’t worry, it has another name that will make your remember it longer, which is bird’s milk cake. Nope, don’t frown just yet, because although the name is bird’s milk, it’s made of usual ingredients. Ptichye Moloko cake is a famous Russian dessert that’s made of a thin layer of chocolate on both top of the cake and underneath it. In between those chocolate, there goes the soft milk soufflé that will please your taste buds as soon as you take a bite. If you’re a big fan of chocolate-covered dessert, then this will be just the right choice for you. Simplicity is good, at least that’s what imply to this humble Russian traditional bread. It’s a simple bun made by sweet yeast that’s still Russian’s favorite. To eat this delicious bread, there are various way such as with cottage cheese, jam, sugar, puree, anything. If you prefer to move this as the appetizer instead of dessert, then you can choose the savory version of it, completed with onion. It’s the time for candy to shine. This Russian traditional dessert can let you enjoy the delicacy of eating nuts in a candy form. What kind of nuts do you like the most? Almond, walnut, nut, hazelnut, all can be transformed into this yummy candy by coating them in sweet grape juice. Churchkhela came in the form of candle or sausage and it isn’t only popular in Russia, but as well as Iran, Greece, Turkey, Persian, Ukraine, etc. Well, if you see by its name, it’s a cake that’s related to France, right? You’re right. Napoleon cake is made in Russia when it’s the 100 years victory of Russia against the French army. This delicious cake has a crispy, thin layers of pastry that’s combined with layers of cream. You can imagine how crunchy will it be when you take a bite, then followed by the creamy taste that melts right away in your mouth. Anyway, if you take a closer look, Russia isn’t the only one that has this tasty dessert. It’s something you can find in the UK as vanilla slice, while in France, they have millefeuille, etc. Again, don’t worry about unfamiliar name when it comes to tasting dessert all over the world. It might be tricky to say it out loud, but as long as it please your taste buds, who cares? Medovik is one of the most favorite dessert in Russian cuisine that you should try as least once in your life. The very first tongue that’s pleased by this honey cake is the Empress Elizabeth, the wife of Emperor Alexander. Her love for honey expressed well by eating this layer cake that’s originally made of honey and sour cream. Nowadays, there are few variations of this, such as using buttercream or condensed milk. Muraveynik, also known as anthill, has been a favorite Russian dessert that can be bought from the store or made at home. This simple dessert has such unique shape, that it’s named as anthill. Made from cookie crumbs and cream, this dessert has just the right crunchiness and softness that works well together. In another countries, such desserts are also made, but every country has their very own unique recipe, ingredients, and presentation variations. Planning to have a party or feast with your neighbors and friends? 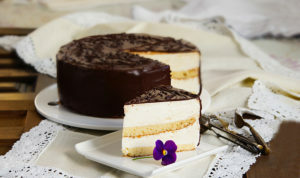 Then this cake can be a great recommendation for you aside from these best Russian food for party or celebration. This simple cake that’s consisted of chocolate and vanilla layers will please both your eyes and tongue. Inside, you’ll get the taste of the cherry, vanilla creams, completed with the crunchiness of the nuts. While on the surface, the goodness of chocolate greet you sweetly, let you fall for this dessert in instant. Although nowadays, gingerbreads are made in every part of the world, it would still have differences, right? Here, in Russia, gingerbreads are originally made with the mixture of flour, honey, and berry juice. Inside this spicy dessert, you can find jam or condensed milk that will balance the taste that you get. Craving for dessert? Russian grabs fruit puree, egg whites, and sugar or honey to make one of the famous confectionary, Pastila. It’s mostly found in the square shape with its airy texture. After being baked in the oven and being dried for few periods of time, then this sweets can be enjoyed right away. Its pure fruit taste will make you craves for more of this dessert. Blini is Russian pancake that can be found in round shape, made by wheat or buckwheat flour as its dough. Russian usually eat this pancake along with sour cream, butter, just like the usual pancake. However, the thickness of this wheat pancake is more alike with crepes rather than usual pancakes. For this crepes, you can also use your own preferred toppings that will make it less boring even if you eat it every day. Embracing the awesomeness of world’s cuisine is something so special. It lets you to get to know with every single country that you tried the dessert, without even going there. You can feel that careful hand, creating such a beautiful recipe that has its own characteristic or even purpose. For example, in Russian, there’s manti to celebrate Eid Al Fitr. Even if perhaps, what you’re eating in your country right now is another version of one of the most favorite dessert in Russian cuisine listed above, it’s still different someway somehow. Grab your chance, take a bite of the sweetness of Russian dessert and get amused.